Bacon, egg, kewpie mayo, iceberg, kansas city BBQ sauce on sesame. sausage, egg kewpie mayo, iceberg, kansas city BBQ sauce on sesame. Smashed avo, lemon, pickled red onion, capers, herbs on seedy grain. Orange bircher, goji, toasted seeds + nuts. Fruit salad, passion fruit yoghurt + dried berries. Buckwheat granola, coconut yoghurt + almond milk. strawberry eclair balls with vanilla creme patissiere. 4 x blueberry bagels + almond butter, 4 x orange bircher, 8 x love you lox bagel. 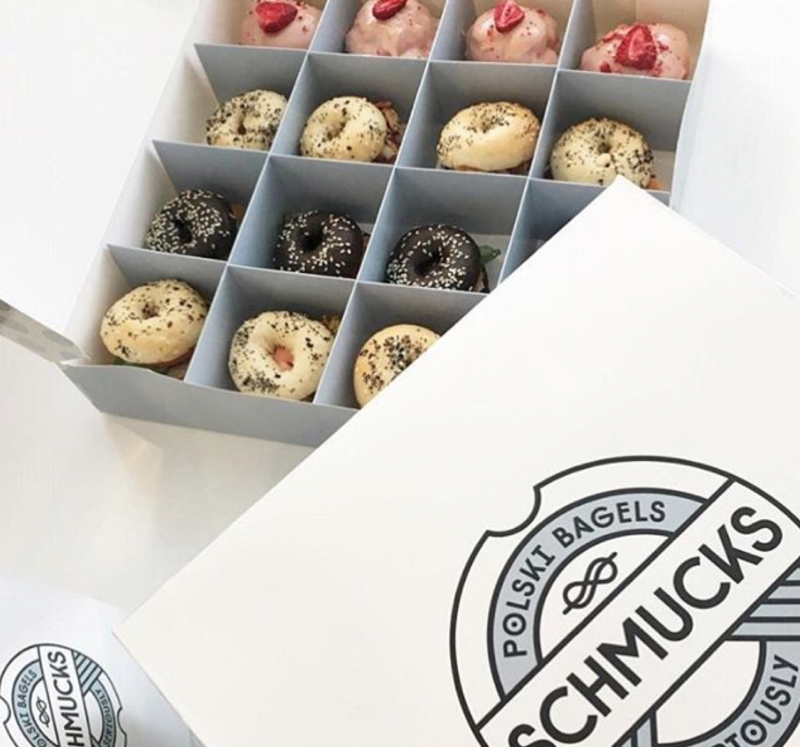 4 x schmuck salad (1 type) 4 x luv u lox bagel, 4 x oy vey bagel, 4 x strawberry clair balls. chefs selection of 16 serious mini-bagels from our instore menu. 8 x salad cups(2 types), 8 x sweet treats (2 types). brown rice, roasted sweet potato, celery leaf, currants, hazelnuts, dill. Heirloom roasted beetroots, quinoa, goats cheese, walnuts. Tumeric roasted cauliflower, buckwheat, chilli, almonds, baby spinach, seeded mustard dressing,. Buckwheat sobba noodles, broccolini, green beans, pickled ginger, wasabi dressing. Heirloom carrots, pomegranate, faro, hemp seeds, maple dressing, smocked yoghurt. polski potato salad, McClures pickles, capers, dill, smoked kewpie mayo. Sweet potato, pickled carrots, red quinoa, mint, feta, smoked yoghurt. orange, red, redder, green, greener. Cranberry, blood orange, lemon, mineral water.